in Malaysia back in 2009, and since then, Malaysians have been avid users of the service on both their desktops and mobile devices. So today, we are happy to announce three new features for Malaysia that we hope will make the map even more useful — especially for a nation with a lot of commuters. 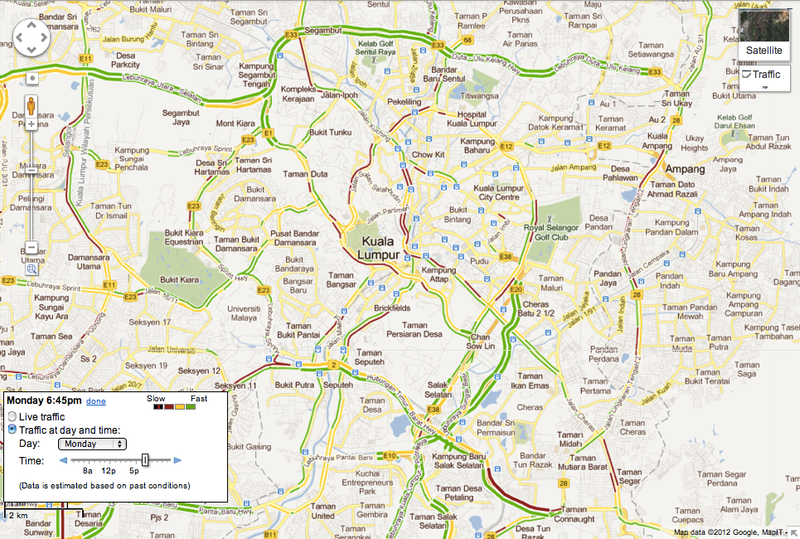 First up, we have implemented the Traffic layer, which provides data about real time road congestion right on the map. Users can quickly see whether roads are congested or flowing freely based on colour coding — red for choc-a-bloc, yellow for slow moving, and green for smooth flowing. Second, Transit information is now available, meaning that Malaysian public transportation details can now be found on Google Maps. This means that train and bus stops are now listed on the map, but more importantly, when you go to the “Get Directions” tab, you will see a new option — designated with a bus icon — to plan your route via public transport. The results of your search will give you step-by-step public transportation directions on how to get from Place A to Place B via bus, LRT, monorail, and Komuter train. Finally, Google Maps is now available in Bahasa Malaysia, giving Malay native speakers better accessibility and the option of interfacing and navigating with Google Maps. Since 60 percent of Malaysians use Bahasa Malaysia as their primary language with over 90 percent proficiency, this localisation should make it easier for Malaysians to get the most from Maps. 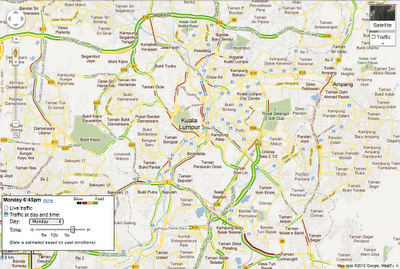 To plan your journey and and get ahead in your travels, go to maps.google.com.my. 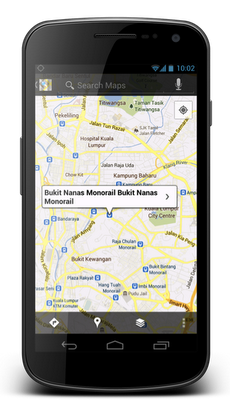 We originally launched Google Maps in Malaysia back in 2009, and since then, Malaysians have been avid users of the service on both their desktops and mobile devices. So today, we are happy to announce three new features for Malaysia that we hope will make the map even more useful — especially for a nation with a lot of commuters.